Have you heard about this? That man stood up on the stage at the MTV Movie and TV Awards last week and basically took everyone to church, Peter Quill style. He had “nine rules for living” to pass along that included bits about pooping at a party and giving a dog medicine, but ALSO included a promise that God is real, a reminder that we all have immortal souls, a declaration that none of us are perfect but there is grace for us that was paid for with someone else’s blood (I KNOW, RIGHT?!?! ), and a directive to LEARN TO PRAY. But. You guys. 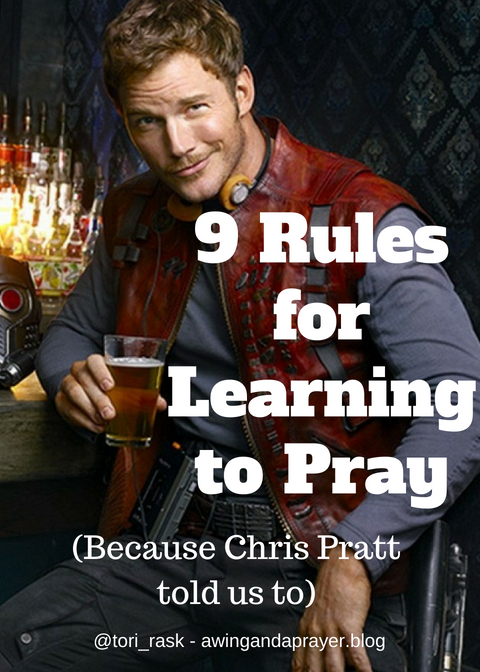 ACTUAL STAR LORD has told us that God is real and we should learn to pray. But, like, how? He told us it’s easy, and he’s exactly right. But, we humans are very good at taking easy, breezy, beautiful things and making them way over-complicated and bogged down with our own baggage and issues and nonsense. Whether we’ve never actually prayed before, used to pray and have gotten away from it, or pray all the time every single day, we could all use a back-to-basics moment to help us step into this challenge handed to us straight from Jurassic World by Owen himself. It’s easy– Andy Dwyer said it, you guys, and there was no lie in him. If you can talk, you can think, you can feel, then you can pray- and do it WELL. There is no wrong way– This is not like learning to deadlift at the gym. You’re not going to get your form wrong and pull a hamstring that injures you, God, and the entire universe. The only way to get praying WRONG is not to even try. God is HERE for you and your prayers. God isn’t butthurt that you haven’t prayed in awhile. He’s not going to give you the side eye like, “Well, it’s ABOUT TIME you showed up.” He’s not too busy. God is not subject to the confines of time, space, and human pettiness. This Father is all grace, all love, all patience, and all about His children- aka you and me. Start with your heart- If you don’t know what to say, just talk to God about what you’ve been thinking and feeling lately. Feeling lonely? Feeling grateful for something? Did someone or something hurt your feelings? Are you really excited about something happening soon? Are you worried? Angry? confused? down and not sure why? Tell God about it. Bring your faith struggles– Maybe you’re not quite sure as Emmet Brickowski is that God is real. Possibly you’ve felt abandoned by Him in the past. Could be that you’ve experienced hurt, rejection, or betrayal at the hands of Christians and the church. TELL GOD ABOUT IT! That is actually POWERFUL prayer material, God knows how real the struggles are for us and wants to help us find our way through it. You can ask Him for help– “Lord, teach us to pray.” It’s in the Bible. Twice. In Matthew 11 and Luke 6. The disciples asked Jesus to teach them to pray. We can ask the same thing. And you know what? God knows how to communicate better than we do, He’s strong where we are weak, He can reach down when we can’t reach up. Say, “Dad, I want to get to know you better. Will you teach me?” What Father wouldn’t jump at the chance? I am Groot- Still don’t know what to say? Can’t find the words to express all of the thoughts and feels? God’s got it covered. Romans 8:26 says, “…we don’t know what God wants us to pray for. But the Holy Spirit prays for us with groanings that cannot be expressed in words.” The Holy Spirit is Rocket to our Groot. He knows what we mean, He can translate, He can respond. If all we can muster is “I am groot…” Rocket understands. If words fail, pray anyway. God does not condemn– God won’t say anything to you that will make you feel bad about yourself, that’s not how He operates. He will lead you to do better through convincing you of your value, not by condemning you for your shortcomings. If you start to hear a voice telling you you’re bad, you’re worthless, you’ve messed up too badly- THAT! IS! NOT! GOD! Tell that voice to sit down and be SILENT! Your Father’s voice is love, anything else is not of Him. Never stop learning to pray– We were designed for connection to God. Our immortal souls CRAVE it, and every single day we can get better at drawing near to Him- and our lives will be better because of it. The more we talk to Him, learn about Him, cling to Him, the stronger we will get. Life won’t ever be perfect or easy, we live in a fallen kingdom and Jesus assured us that trouble is to be expected. (John 16:33) But he also overcame the world, and aligning our hearts with that world-overcoming power is something we can get better at every single day. So have a chat with God today- I would not want to make Star Lord angry, would you? Sit back, relax, and give it a try. And then do it again tomorrow. And keep doing it. Oh, and as for the dilemma of pooping at a party…there is also such a thing as pocket sized Poo-Pourri. You’re welcome. Hey there, Tori – obviously I love this post! And I think our readers at ForEveryMom.com would love it, too. Would you allow us to republish it on our site? We’d give you full credit, link back to the original post, and include your head shot and bio. What do you think? I would be flattered and thrilled!